The idea of the famous as an elite group of individuals, marked out by their superior talents, was nurtured by both literature and the visual arts in eighteenth-century Britain. Against a background of growing interest in recording and celebrating their achievements, Reynolds opted to associate with the most famous people of his age. Using all his charm and diplomacy, Reynolds cultivated a circle of gifted and intelligent men and women. He entertained them, introduced them to one another and, through his portraits, confirmed their fame. His association with leading intellectuals such as the moralist and writer, Samuel Johnson, and the playwright and poet, Oliver Goldsmith, was formalised through ‘the Club’, the crucible of London’s intellectual life. Outside this hub, Reynolds also painted other eminent figures such as the novelist, Laurence Sterne, and the aesthete, Horace Walpole. His continuing success depended above all on timing: his ability to produce an unforgettable image at the very moment the public craved it. And he could convey not just appearances, but also intrinsic merits. Reynolds did not simply paint people who were famous: he revealed the reasons for that fame. 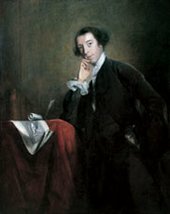 Horace Walpole was the youngest son of Sir Robert Walpole, the country’s prime minister. As a young man he had made the Grand Tour to France and Italy. On his return he began to establish his reputation as a collector and scholar. Reynolds emphasises his connoisseurship by the unfurled print showing a large stone eagle, emblem of intelligence and nobility, which he had bought in Rome. The quill and the gesture of his hand on his chin symbolise his career as a writer. 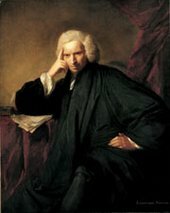 Reynolds painted this portrait of Laurence Sterne to mark the publication of his popular novel, The Life and Opinions of Tristram Shandy, at the beginning of 1760. This racy, irreverent book transformed Sterne into a celebrity. Sterne is dressed in a black clerical gown, but it is his expression that commands attention. The secretive half-smile captures wonderfully the essence of his satirical genius. George Selwyn was a politician, wit, gambler and Satanist, who also had a morbid fascination with dead bodies. In this portrait Reynolds successfully conveys Selwyn’s deadpan humour. By contrast, his sprightly pug dog transfixes us with his beady eyes. The habit of SEEKING FAME in this manner left his mind unfit for the cultivation of PRIVATE FRIENDSHIP. Garrick died without a real friend, though NO MAN had a greater number of what the world calls friends. 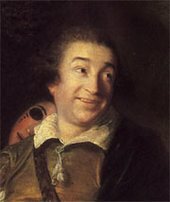 David Garrick was one of the most celebrated and versatile actors in British theatrical history. He is shown here, at the height of his fame, in the role of Kitely, a jealous merchant in Ben Jonson’s comedy, Every Man in his Humour. Reynolds highlights the moment when Kitely suspects his wife of being unfaithful. 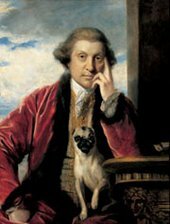 Reynolds and Garrick socialised together, but Garrick was not admitted to the Club for some years; Samuel Johnson was afraid ‘he will disturb us by his buffoonery’. Mary Monckton was one of London’s leading socialites. She attracted a wide range of celebrities to her salons, where - as here - she greeted her guests sitting down. As she grew older her behaviour grew increasingly eccentric. Towards the end of her life Mary even attracted the notice of the young Charles Dickens, who apparently used her as his model for Mrs Leo Hunter, the celebrated hostess in his first novel, The Pickwick Papers. This is a STRONG PORTRAIT and shews an Artist can do with paint more than nature hath attempted with FLESH and BLOOD, Viz - put good sense in the countenance. 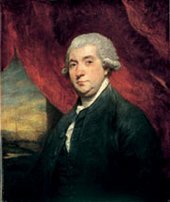 James Boswell was the author of the most famous biography in the English language, The Life of Samuel Johnson, which he dedicated to Reynolds. A lawyer by training, Boswell had arrived in London in 1762 and decided to become a writer. He made it his mission to meet as many famous people and to enjoy himself as much as possible. 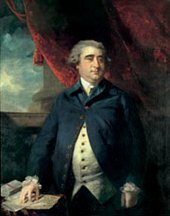 As contemporaries noted, by the time Reynolds painted this portrait, Boswell’s constitution had been ravaged by binge drinking and sexually-transmitted diseases. Mr Gibbon, the historian, is so EXEEDINGLY INDOLENT that he never even pares his nails; his Servant, while Gibbon is reading, … performs the OPERATION. 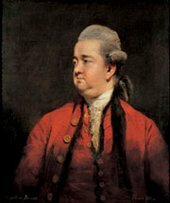 Edward Gibbon was the celebrated author of The Decline and Fall of the Roman Empire. He was also a close friend of Reynolds. Together they dined, gambled, attended masquerades, and enjoyed London’s clubs. According to a mutual friend, Reynolds’s portrait of Gibbon was ‘as like the original as it is possible to be’. His hair was SILKY and white; his eye animated and light blue; his cheeks sprinkled with broken red… His GAIT and AIR were noble; his gesture slow; his look full of dignity and COMPOSED FIRE. Adam Ferguson was an eminent Scottish philosopher and historian. He was recognised as the father of modern sociology for his writings, particularly the Principles of Moral and Political Science 1792. Ferguson believed in the progress of humankind, and used his knowledge of the classical world to advance arguments on the ameliorative nature of society. He had much in common with Reynolds’s immediate intellectual circle, which may have prompted him to commission this portrait. Charles James Fox was one of the most charismatic figures in Georgian politics. 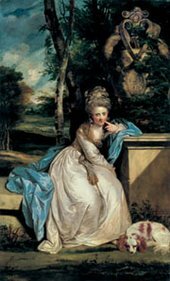 Reynolds, who was Fox’s close friend, exhibited this portrait at the Royal Academy in 1784, during the height of a bitterly contested parliamentary election. Fox appears in the buff-coloured waistcoat and blue coat traditionally worn by supporters of the Whig party. His hand rests on his controversial East India Bill, underlining his defiant stance towards the king’s ministers. 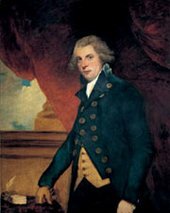 Richard Brinsley Sheridan rose to fame as an actor, theatre manager and playwright. He is shown here in his other role as the greatest parliamentarian of the age. Reynolds celebrates what came to be regarded as the finest parliamentary performance of all time, Sheridan’s speech on the Begums of Oudh. 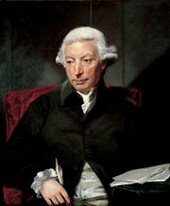 This resulted in the impeachment of the governor-general of British India, Warren Hastings.